Finally make your clothes behave in LW! There are three bone relation situations - both items have the same skeleton - easy, the conformed item has a cut down version of the target skeleton, the case with most clothes - this requires careful calculation of the new root bone to keep it in sync with the matching child bone in the target, and mismatched bones, where pieces have been removed within the skeleton - we simply unparent these bones that are parented differently than the target bones and treat them as new root bones. We can conform any figure whose bones exist by the same name in the target. Unmatched bones are not conformed, so while the conformed figure can have less bones than the target, it can NOT have more. That's the only rule for using the conform tools on your own custom created figures. 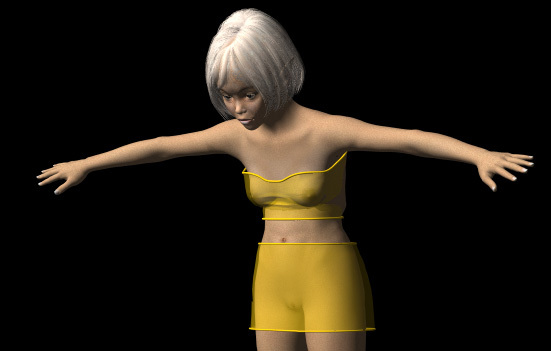 By default, rotation and position are conformed, leaving scale free to adjust clothes fit. The adjust for base position, means the base offset of the conformed figure is used in the calulations. This means that wherever you put the figure in the sceen all bones will snap exactly to the targets. Sometimes, however, you may want to shift a conformed figure a bit, move it up or down a little, for example. With the bones fully conformed you can't do this. 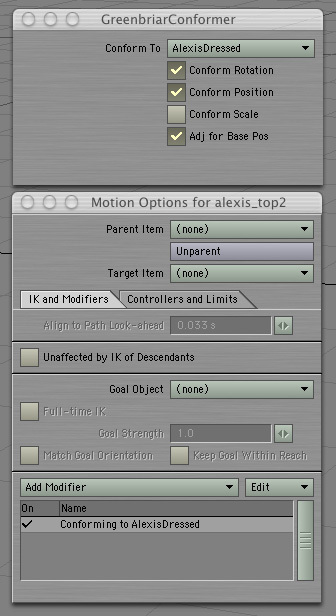 So we added this feature so you can put the conformed item at 0,0,0, then move it in any direction by how much you need to shift it, turn off adjust for base and it will conform, but offset by how much you moved it. You must turn the Master switch off to position items and set the animation on the target figures. 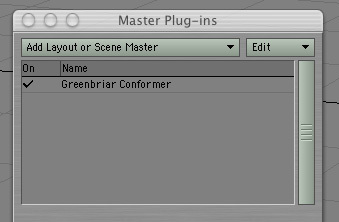 LW DOES NOT like it when you try to move something that is under plugin control. When you click the Master back on, everything snaps to the new locations. And of course it is left on during animation.